These beautifully crafted hankerchiefs are stylish enough for daily use or special occassions (e.g. as pocket square), also perfect gifts for fathers, grandfathers, gentlemen, or anyone who enjoys hankies. Every handkerchief is selected elaborately. We pay full attention to any detail during the process from raw material picking to finished handkerchief, to ensure the product we delivered to Blank&Black. We work hard to offer high quality products, and we strive to maintain superior customer service for our customers. Please feel free to contact us if you have any questions about our handkerchiefs. 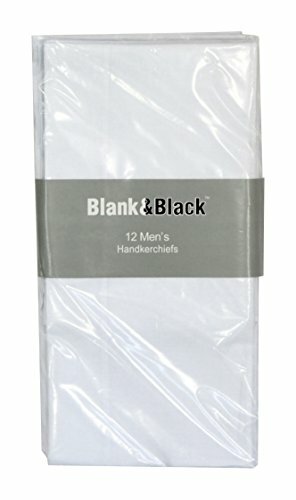 If you want to purchase other styles of handkerchiefs or more of our products, please search Blank&Black for all we are offering. Thank you! Wondefully Crafted from 100% Premium 60S Cotton - not like most handkerchiefs in the market of 30s or 40s, the 60S cotton makes the hankies naturally soft. Not too thick, not too thin. 60S Cotton is the perfect handkerchief material. Size of 17 x 17 inches Each - Perfect size fit for any occasions. The first time you wash them, they will shrink a bit, but only on the first wash.
Package - 10/12 Pieces of White handkerchiefs set. Stylish enough for daily use or special occasions. Nice Package, great gift. A Great Gift for Any Occasion - Perfect for home business restaurant party picnic bar wedding, or anyone who enjoys a classic hankie. So add them to your cart and start enjoying these lovely handkerchiefs! If you have any questions about this product by Blank&Black, contact us by completing and submitting the form below. If you are looking for a specif part number, please include it with your message.